IDF spokesman says Israel retaliated for rocket fire, emphasizes Iran is playing with the lives of Gaza's residents. An IDF spokesperson on Saturday evening announced that IAF planes attacked a Hamas observation post in southern Gaza. The attack was in retaliation for three missiles fired from Gaza towards Israel on Friday. Two of the missiles were intercepted by Israel's Iron Dome, while the third fell in Israeli territory and damaged a building. "The missiles fired on Friday proved once again that Iran, via rebellious, extremist terror organizations, is working to deteriorate the regional situation and playing with the lives of Gaza residents," the spokesman said. 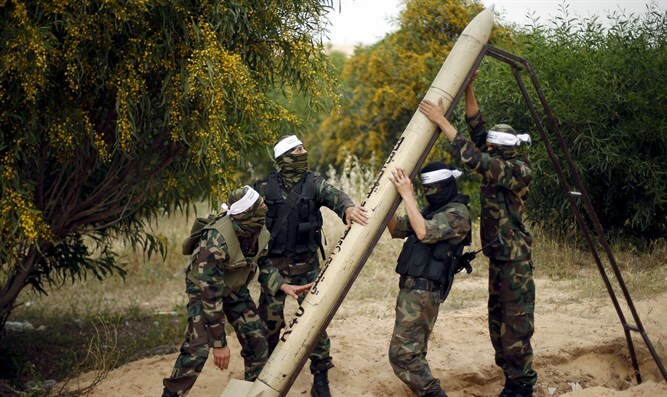 "This may cause an escalation in the Gaza Strip, after years of quiet and security. Hamas bears full responsibility for the current situation and its consequences." On Saturday night, Israeli Defense Minister Avigdor Liberman (Yisrael Beytenu) told Channel 2's "Meet the Israeli Press," "Investigations into the rocket attacks yesterday show that the missiles were manufactured in Iran. This is extremely serious... It is too early to say which faction received the missiles from Iran." Earlier, Liberman encouraged Gazans to think of their children's future and "pressure Hamas leaders to change their direction." Tags:Hamas, IAF, IDF, Gaza Region, rocket attacks.